A few years ago someone asked me what my favorite movie-going experience had been, and I couldn't name even one that I had really enjoyed. Being a classic film fan with limited access to independent theaters meant that my experiences had been few, and unfortunately the disrespectful audiences meant that those few experiences had all been pretty bad. And then 2014 happened. Last year I saw some of my favorite movies on the big screen (I still think I dreamed it -- pinch me?!) like Dr. Zhivago, Young and Innocent and Sunday in New York. I went to the TCM Film Festival and enjoyed every film surrounded by moviegoers with an equal (or possibly even more fervent) reverence for classic movies. My local theater, The Garden in Princeton, came under new management and started playing classic movies. (Seriously, am I dreaming?) All told, last year I managed to see 17 classics on the big screen. And with the exception of a mildly disrespectful crowd at the Film Forum (the original Japanese Godzilla isn't funny, what is the matter with people?) I enjoyed every one of those experiences immensely. Until last year, I always thought that the best way to watch a movie was at home, preferably in pajamas, surrounded by cats and junk food (or, more accurately, some form of potatoes.) But now I'm officially a big-screen convert. Why is it that a movie flickering on my 30" tv screen can impress me, but the same movie displayed in 52' Cinemascope can knock my socks off? Why is it that when I hear biting dialogue at home I giggle, but that same dialogue blasting through surround sound speakers gives me a full-on belly laugh? 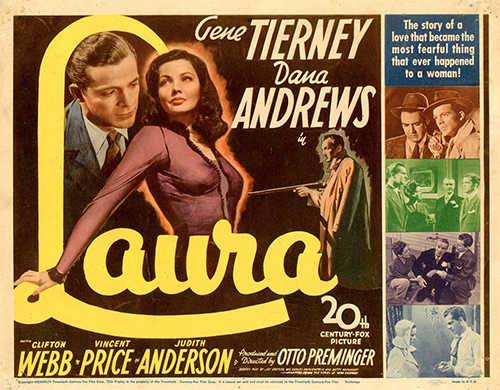 Laura has been one of my favorite movies for a long time (thank you, intense Dana Andrews phase circa 2008) and I've seen it more times than I could count. I've always thought Clifton Webb's dialogue was absolutely hilarious, and I swoon (oh, how I swoon) when Dana Andrews is on screen. But seeing it at the movies was like seeing it for the first time. I knew all of the twists and turns, and yet they surprised me. The dialogue was as familiar to me as an old friend and yet it passed through my ears as if it were a new acquaintance. And.. let's just say swooning intensifies when the apple of your eye is 20' tall. I can't say anything about Laura that hasn't already been said. It's a film noir masterpiece. It's beautiful, suspenseful, clever, witty, dark, slightly twisted and very addictive. Maybe I've been spending too much time binge watching things on Netflix (I have) but I felt myself wanting to play the next episode when the movie was over, desperately wishing that this wasn't the end. Of course the good thing about good movies is that, despite their lack of a second episode, they're ripe for re-watching over and over. And if this experience has taught me anything, it's that you're never so familiar with a movie that you can't enjoy it as much as you did the first time around. Especially if you're seeing it at the movies. Also, oops, I just realized my title has almost the same name as Laura's blog! Do you know about the Nitrate Picture Show happening at George Eastman House in Rochester, NY this May? They're going to be screening classic films on original nitrate prints (which stopped being manufactured in 1952). There are only a handful of places in the world that are still allowed to project nitrate film because of its high flammability, but those who have seen it say that there's nothing else like it.